This Saturday, January 18, annual favorite Sing and Skate Against Breast Cancer will wow spectators at Bank of America Winter Village. This free one-hour concert will feature performances by Olympic skaters and aspiring talent, as well as Broadway stars singing their favorite tunes. The show is free and open to the public, but VIP ticket information is available here. 100% of the proceeds benefit the Breast Care Navigation program at Jacobi Medical Center. The Breast Care Navigation Program provides assistance and support to patients undergoing breast cancer treatment, helping them navigate the complexities of their treatment and resulting in improved outcomes and better quality of life. If you want to support a good cause, are looking for an excellent pre-dinner date activity, want to inspire a talented youngster--or couldn't get enough of the Tree Lighting Show!--this event is sure to please. 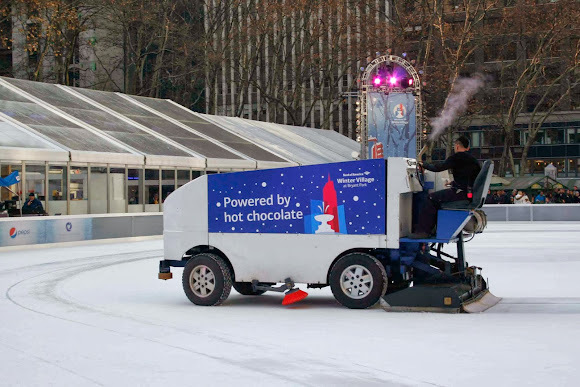 The ice resurfacer will work overtime to make the ice smooth for our talented performers! Please note: Public skating will be unavailable from 4:00 - 6:00pm. The skating pavilion will be open during the performance. Public skating will resume at 6:00pm.